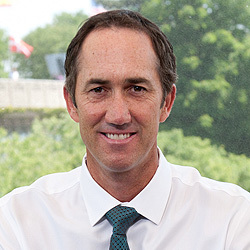 Darren Cahill - ESPN Press Room U.S.
Former professional tennis player and coach Darren Cahill has served as an ESPN tennis analyst since the Australian Open in January 2007. Nicknamed “Killer”, Cahill turned professional in 1984. He won his first tour doubles title in 1985 at Melbourne, and his first top-level singles title in 1988 at Gstaad. Cahill’s best performance at a Grand Slam event came at the 1988 US Open, where he knocked out Boris Becker in the second round on the way to reaching the semifinals, where he lost to eventual champion Mats Wilander. In 1989, Cahill finished runner-up in the men’s doubles at the Australian Open (partnering with Mark Kratzmann). Cahill was a member of the Australian team which reached the final of the Davis Cup in 1990, losing 3–2 to the United States. Cahill compiled a 6–4 career Davis Cup record (4–0 in doubles and 2–4 in singles). Cahill won his last tour singles title in 1991 at San Francisco. His last doubles title came in 1994 in Sydney. His career-high rankings were World No. 22 in singles and No. 10 in doubles (both achieved in 1989). Cahill retired from the professional tour in 1994 due to a knee injury. Since retiring from the tour, Cahill has been a successful tennis coach, working with high-profile players Lleyton Hewitt, Andre Agassi and Simona Halep. He guided to become the youngest player ever ranked No. 1 and Agassi to be the oldest player ever. In 2017 and 2018, he coached Halep to No.1 on the WTA Tour and win her first Major, the 2018 French Open.